People often ask me where they should go for the ultimate foodie vacation and, without fail, I tell them to go to the Basque Country. It may not be as renowned as Paris, as storied as Tuscany, or as diverse as New York, but this little region on Spain’s north shore packs more culinary punch into one trip than those later three combined. The chefs of Basque Country hold quality ingredients in such high regard that they tend to do as little manipulation in the kitchen as possible, choosing instead to let the beef, fish, grapes, etc. speak for themselves. Combine those pure flavors with mountainous scenery and jovial atmosphere and you’ve got Paris any day. 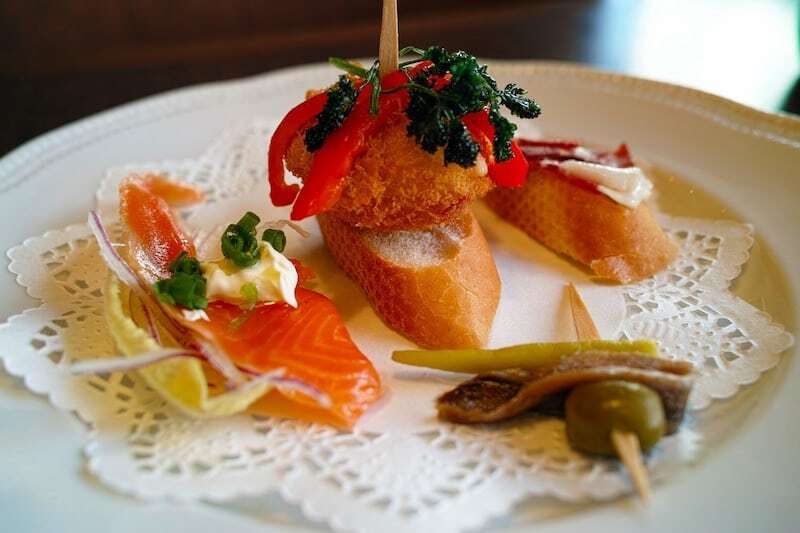 Pintxos are the Basque answer to Spanish tapas and San Sebastian is the ultimate place to try them. The old city center is a grid of pedestrian streets lined with traditional bars and restaurants, all of which serve dozens of small bites to be had while leaning on the bar and sipping cider. Do as the locals and simply saddle up to the counter, pick out a few items from the blackboard menu and toss your napkins on the floor. If you’re feeling festive, take a drink out into the streets to chat with other revelers or try your hand at drinking from a porron, a special pitcher made for pouring wine directly into your mouth or, if you’re like me, on your shirt. Some of my favorite pintxos bars in San Sebastian are La Cuchara de San Telmo, Atari Gastroteka (for torijas), Paco Bueno (for fried shrimp), Andra Mari (for el secreto), La Vina (for incredible Basque Burnt Cheesecake! ), Taberna Gandarias (for chuleta), Ganbara (for grilled mushrooms), La Cepa (for jamon jabugo), and Borda Beri (for orzo risotto). Of course, you’re bound to get thirsty when eating so many tapas, which is why it’s important to drink a lot of txakoli. This lightly fizzy, ultra-dry white wine is low in alcohol and pairs perfectly with the region’s delicate seafood and warm weather. Get your hands on a copy of the txakoli wine route, which winds along the Basque coast leading to numerous vineyards open to the public. Here you can take tours of the small productions, sample choice bottles, and spend some time in the rural foothills overlooking the ocean. San Sebastian has more Michelin stars per capita than anywhere else on the world. This means, that outside of all the casual dining to be had at tapas bars, there’s still an entire other world of cuisine in this one small city. 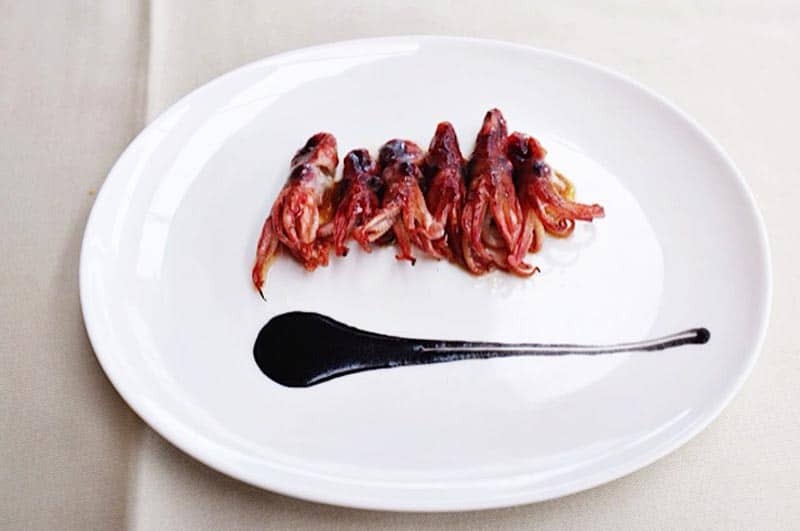 Some of the more lauded hotspots include Mugaritz, Arzak, Akelare and Elkano. But my favorite is Asador Etxebarri. This minimalist restaurant is about an hour's drive out outside of Bilbao in what can barely be qualified as a town. The setting is downright pastoral with the dining room overlooking the mountain scenery and cows grazing just outside. The chef here is famed for sourcing top quality ingredients and doing little more than cooking them on custom-build wood-fire grills. Despite the lack of bells and whistles, the dishes at Etxebarri seem almost technicolor in flavor. Steak is steakier, cheese is cheesier and shrimp taste like some kind of heavenly custard. If you are lucky enough to visit the Basque Country in January through April, make sure to stop into a few of the famed cider houses. During these months, the sagardotegi open to the public, allowing locals and tourists alike to sample cider straight from the barrel and gorge on hearty farmhouse food. The scene is hugely communal, so come prepared to chat with strangers and share family style portions of mega-steaks, wedges of cheese and slices of egg tortilla. Much like at txakoli vineyards, you’ll get a chance to see some of the countryside, with the added benefit that many cider houses are within a ten minute drive of San Sebastian. Drink as much as you want, then hail a cheap cab back to the hotel. 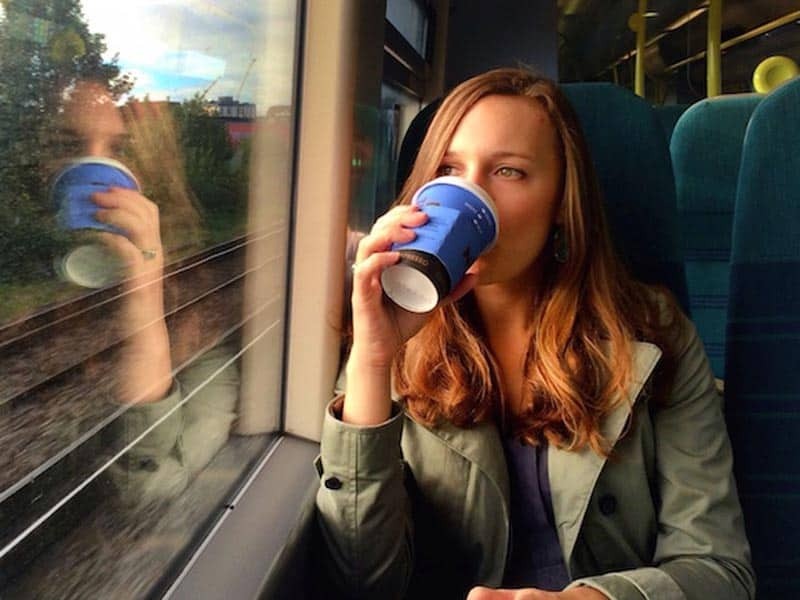 Andrea Duty is a pastry chef and travel blogger from Austin, Texas currently living in London, England. She tries to balance her travels with sightseeing and adventure, but secretly, all she wants to do is eat her way around the world. You can read more about her global binge over at This New View. 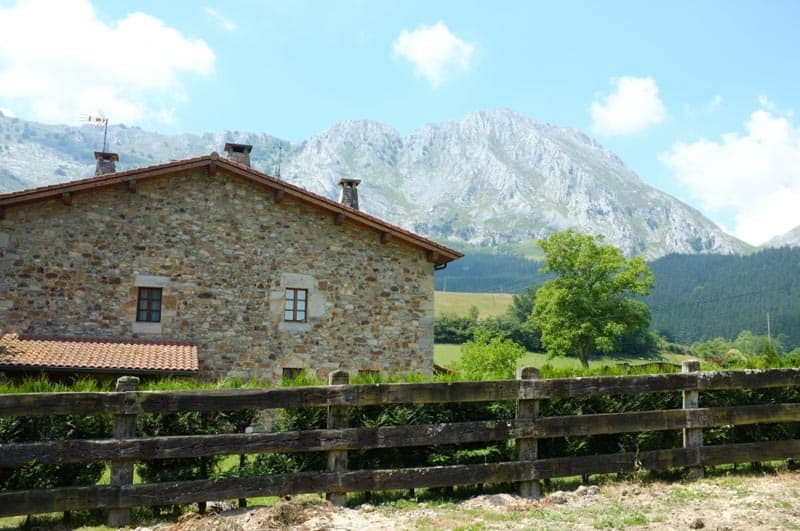 8 Responses to "4 Ways to Eat Your way Through the Basque Country"
Next time we will show you Rioja Alavesa and other magical places of the Basque Country! Great article Andrea! The Basque Country is indeed one of the best places on earth to visit and eat really, really well. But don’t forget about the Rioja wine region – about 1/3 of the wine country is actually in the Basque Country as well. So some of the best red wine (and now even white wine) from Spain and the whole continent for that matter, can be found in the tiny Basque Country. Sounds like a fun and delicious way to travel! The food and drink are definitely important parts of another culture! Thanks for sharing! Great tips on a must see part of the world for me! Looks absolutely lovely for a couples trip. If youlike Greek food , Corfu is the best island of GREECE whit seafood. Absolutely delicious and some really great practical tips. Fantastic post, thank you!